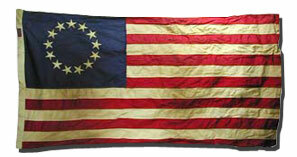 This 3' x 5' cotton flag is part of the Heritage Series from Valley Forge. The hand crafted nature and patented antiquing process have become new hallmarks. This product is constructed of carefully chosen American cotton weaving, meticulously dyed, and accented with solid brass grommets. This product is made in U.S.A. With the tea stained dying process some areas might be darker than others. Each item is not the exact same. Also, may be lighter or darker than what is pictured.